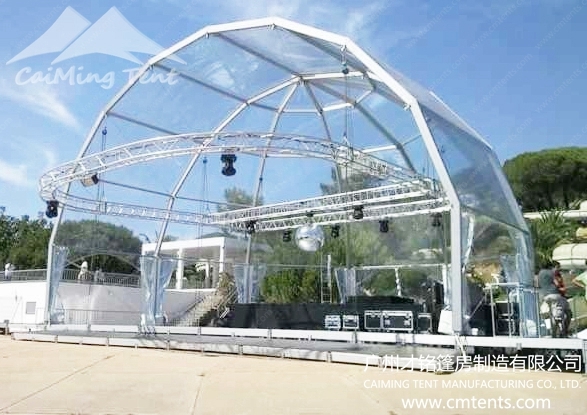 Curve Tent series was developed with the independent design of CaiMing technical team in 2011, it was becoming quite popular and got high praise from all over the world with its high quality and elegant exterior since it’s available. Comparing with the traditional A shaped tents, the shape for Curve Tent is more special. It is modular structure, and can be increased or decreased in 5m bay. Hard pressed extruded aluminum alloy (6061/T6) is adopted for framework. The roof cover and sidewalls are made of flame-retardant double PVC-coated polyester textile, which is strictly conducted in accordance with European DIN4102B1, M2 quality control standards. Curve Tent is not only strong, but also durable, the wind retardancy can reach 100km/h(0.5kn/m²). Curve Tent can be flexibly removed and expanded with its modular structure, it is easily assembled and dismantled, storage volume is small. It can be applied in many temporary events as well as the Big Tent series, also it’s a good choice as permanent building. Due to the bended aluminum roof beams and perfect roof cover tensioning system, the wind resistance and snow loading capability are stronger. A variety of optional accessories expand the function and usage of Curve Tent. Such as PVC fabric sidewalls with arch clear windows, ground anchors, weight plates, decoration roof linings and side curtains, glass walls, ABS solid walls, steel sandwich walls, corrugated steel sheet walling, glass doors, sliding doors, roller shutters, transparent roof covers and sidewalls, flooring system, hard PVC rain gutters, bell ends and so on. Curved tent, also called TFS tent ( tensioned fabricated structure ), is the highlight of our range because of its striking taut roof fabric, amazingly high inside space, the unique arched form and careful finishing. A curved tent hall is very suitable for various purpose, like exhibitions and other high class events, covering for aircrafts, workplaces, shopping centers, covering for various sports like tennis, football, volleyball, basketball, horseback riding, swimming pools, etc.